Megadeth performed their 1986 track, “The Conjuring”, for the first time since 2001 during a June 12 show in Plzen, Czech Republic. The tune from the band’s second album, “Peace Sells … But Who’s Buying”, was featured in their set at the city’s Home Monitoring Arena where Megadeth were opening for Judas Priest. 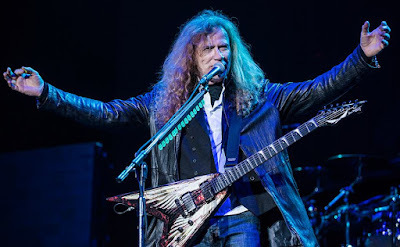 Frontman and founder Dave Mustaine had ceased performing “The Conjuring” in 2001 over its black magic and occult origins because of his changed spiritual beliefs; raised as a Jehovah's Witness, the rocker is now a born again Christian. The project has been completely restored to deliver Mustaine’s intended vision while revealing unheard parts and performances throughout the record with a new remix by veteran metal mixer Mark Lewis (Whitechapel) and remastering by Ted Jensen.